Topics: Who We Are, What We Offer, Philosophy, Lead Consultant, What People Say, and Specialisms. ns1.dfsv21.com, and ns2.dfsv21.com are its DNS Nameservers. It is hosted by Dfl-net (England, Dorset,) using Apache/2 web server. 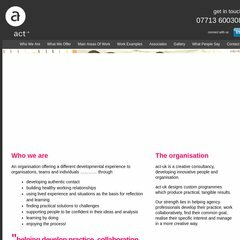 Act-uk.org.uk's server IP number is 91.103.216.78. PING (91.103.216.78) 56(84) bytes of data.